“Marketing’s changed so rapidly…more in the past five years than in the past 500 years,” according to former Marketo CMO Sanjay Dholakia. While the specific numbers may be up for debate, there’s no doubt that the twin forces of digital technology and shifting customer behavior are transforming digital marketing at an accelerated pace. With our industry in the midst of such rapid transformation, it can be helpful to take a look at what’s not changing — the marketing fundamentals that have worked since Egyptians posted sales messages on papyrus wall posters. The old brain — about 450 million years old — does not process written language, and is a center of survival and self-interest. Marketers who speak to the old brain with high-impact visuals and and simple, emotional messages are likely to be more persuasive. All of today’s advanced marketing technology won’t help marketers if they fail to address the needs of the old brain. 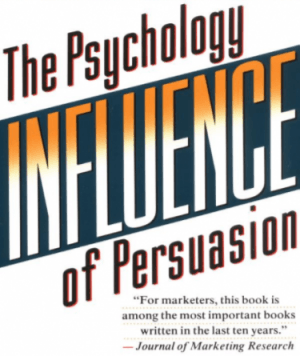 For many marketers, Dr. Robert Cialdini literally wrote the book on how Influence audiences. In fact, it’s called “Influence: The Psychology of Persuasion” and through extensive research and examples, the book explains the psychology of why people say Yes in six key principles: reciprocity, commitment and consistency, social proof, authority, liking, scarcity. Marketers have studied and applied these principles carefully since the book was published in 1984 to improve effectiveness and conversion rates. The six principles remain relevant even after so many years because they are based on human hard-wiring rather than marketing strategies or techniques. Similar ideas have been expressed in terms of Tribes by marketing guru Seth Godin. Today, these principles continue to be used with great success by brands like Apple, Harley-Davidson and Starbucks. Stories will continue to be one of the most powerful forms of communication we have, regardless of channel or medium. Marketers who master both the ancient art of storytelling as well as today’s powerful visual and interactive tools possess a powerful formula to change hearts and minds. Some of the oldest questions in marketing are: How do we know whether our marketing dollars are making an impact? What is the impact? Was the outcome better or worse than expected? Which campaigns are working and which are not? Basic questions, but with difficult answers. And the with Big Data growing bigger each day and customers making multi-channel, multi-device purchases 24 hours a day, things can get tricky fast. Interest in “data-driven marketing” has skyrocketed in the last few years, but the need to quantify marketing spend against revenue results is as old as marketing itself. Analytical skills combined with a testing and optimization workplace culture can create huge opportunities to create your own data-driven marketing campaigns and power up your organization’s bottom line. How many times have you read marketing copy like this? We’re number one in our industry. We’re the leading provider of state-of-the-art widgets to over 30,000 widget users. We’ll help you save time and money. Cut the word “we” wherever you possibly can. Why? Your audience simply does not care about you, your products and your brand. They care more about how well you can answer their questions and help with their problems. In her book “Resonate” (Get a free multimedia copy of “Resonate” here), Nancy Duarte describes the presenter’s relationship to the audience in Star Wars terms. The presenters are not the heros, but a mentors who support the heroes in their quest. The audience takes the starring role and undergoes the hero’s journey and transformation. It has always been thus. People may or may not be interested in your products and your brand, but they are certainly interested in successfully solving their problems and looking good for their peers. There’s a ton of research that supports the old copywriter’s creed that people buy on emotions and then justify their purchase rationally. Although we may not like to admit to making emotional decisions, particularly in a professional context, that’s what seems to occur. In fact, there is a technology called functional magnetic resonance imaging (FMRI) that literally shows that this is true. FMRI allows us to visually map brain activity through changes in oxygen and blood flow. The resulting imagery shows that specific parts of the brain “light up” when emotionally stimulated. For example, research showed that consumers primarily use emotional criteria like personal feelings and experiences to evaluate purchase decisions, rather than features and specifications. Your marketing should appeal to both the head and the heart, but if it’s not emotional, it won’t sell. Marketing tools and technology are constantly changing, and that rate of change will only accelerate. But marketers who build their campaigns on ancient knowledge and time-tested principles can set themselves up for better results regardless of the marketing channels in play. To lean more about Content Marketing Factory services, contact us.